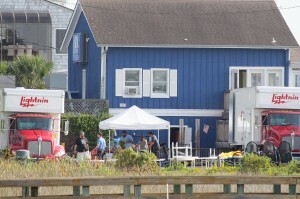 Film crews shoot scenes of "The Choice" on the Hanover Seaside Club's sounded dock Monday, Oct. 20. Nicholas Sparks’ latest adaptation to the movie screen started filming this month in and around Wilmington and Wrightsville Beach. Based on his 2007 novel “The Choice,” scenes for the movie are being taped at various locations including the Hanover Seaside Club this week. Sparks, who is a best-selling author living in eastern North Carolina, said his inspiration for “The Choice” came from his most popular work “The Notebook.” While he admits that it may always be the accomplishment he is known for that fact doesn’t stop him from trying to re-capture the same success in other works. “I set out with the hopes of capturing at least a bit of that magic once more, if only to show that I hadn’t forgotten why people began to read my novels in the first place,” Sparks said in a telephone interview on October 15. “The Choice,” which is set in Beaufort, North Carolina, is the love story of Travis Parker and Gabby Holland who face obstacles in trying to be together; it is a similar element Sparks uses in all of his novels but one he said is meant to parallel his other stories, not copy. “Close enough to feel superficially familiar, but different enough to feel completely unique. And though I simply laid out my thoughts behind the novel in just a few preceding sentences, it took months to actually come up with the central thrust of the story. It’s always like that though: the idea, once expressed, seems obvious. But conceiving the idea in the first place is often a long journey of frustration,” Sparks stated on his website. 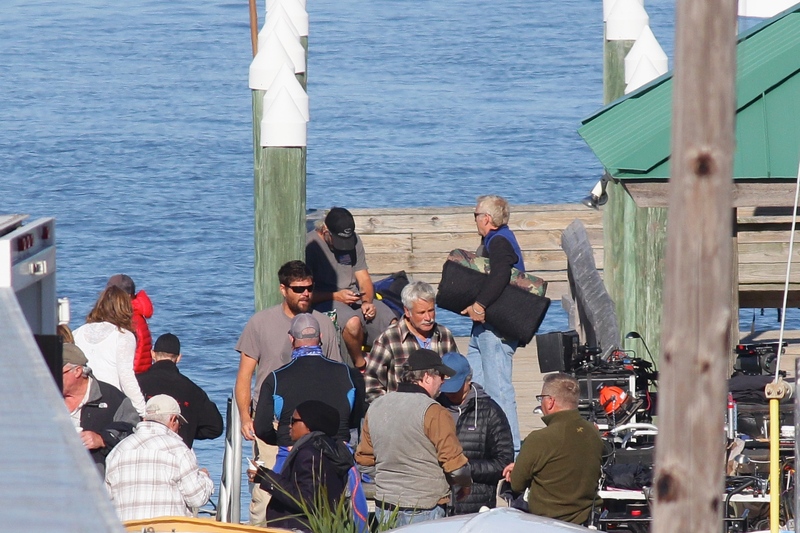 Crews set up to film “The Choice” outside Dockside Restaurant Monday, Oct. 13. The author said filming will take approximately 40 days and end in November. The production team wanted to take advantage of the warmer temperatures while they can. “The water scenes are being filmed now while water is somewhat warm otherwise we would have to take pictures of just the water instead,” Sparks joked. The lead character of Travis Parker, who was inspired by Sparks’ own brother, will be played by Benjamin Walker; Teresa Palmer will star as Gabby Holland. “The Choice” is expected to be one of the last major movies filmed in North Carolina before the state’s Film Incentive Program changes. 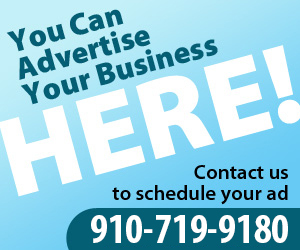 A petition has been started to urge the McCrory administration to broker a deal to maintain the 25% rebate for production companies who film in the state. To date, over 13,800 people have signed the petition, which include New Hanover County residents. “The Choice” is due to hit theaters in the fall of 2015. Sparks’ other film, “The Best of Me” was released last week. Other adaptations of Nicholas Sparks’ novels have grossed over three-quarters of a billion dollars.